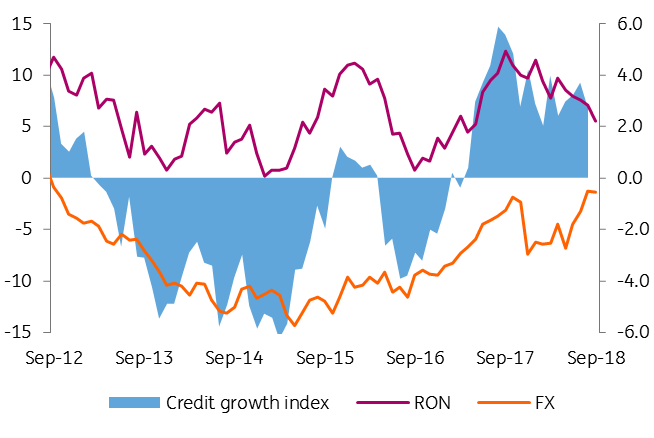 Retail loans accelerated slightly from 10.9% in Aug-18 to 11.0% in September as the share of RON lending in total retail loans reached a record 70.7% in September. 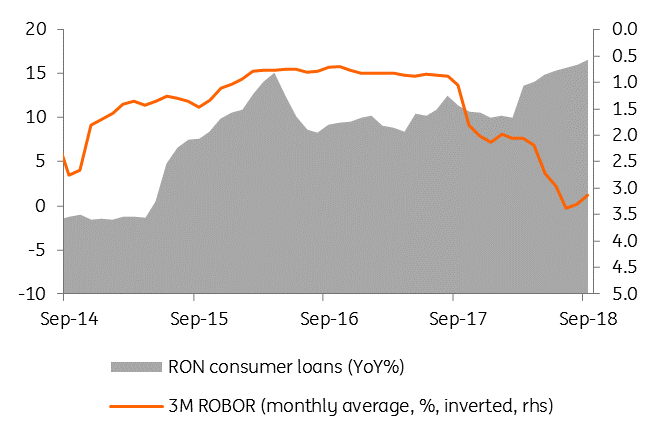 Consumer loans in local currency marked the seventh consecutive month of acceleration, printing 18.5% year-on-year growth while mortgage lending slowed down to 33.7% YoY growth from 34.0% in Aug-18. According to the new provisions adopted by the National Bank of Romania (NBR) (the so-called macro-prudential measures), the maximum level of indebtedness for households will be 40% of the net income for local currency loans and 20% for hard currency ones, applicable starting 1 January 2019. While the impact on bank lending will likely be rather marginal, we think that these measures will help to minimize the number of rate hikes in 2019 and thus reach a lower terminal key rate. Corporate loans decelerated by 2.7% year-on-year in September from 3.7% in August. As previously mentioned a mild recovery in FX lending could be underway on the back of higher interest rates for the leu and a stable exchange rate. The share of FX lending in total corporate loans marked the fourth consecutive increase, albeit a modest one, from 40.4% to 40.6%. So far it seems that the NBR’s ambition of containing inflation without compromising credit growth is only partially working out. On one hand, inflation remains stubbornly elevated, while on the other hand, lending activity is still more household and less corporate driven. Tapering the former does not necessarily stimulate the latter.